Tsuneo Sanda is a prolific Star Wars Illustrator as well is expanding his collaborations with Disney Fine Art to create unique and captivating artworks! Tsuneo Sanda was born in Osaka, Japan. His early idols include Rembrandt, Rene Magritte, Paul Davis and Robert Peak. Sanda first discovered his love for art at the age of 7. 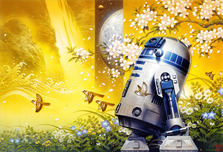 A Star Wars fan since 1977's A New Hope, he describes the film as "filled with dreams". The saga continues to be "a part of my brain cells" even today. "The first few moments of each episode overwhelm me," Sanda says, "exploding in my head like brilliant fireworks." Remember every time you purchase Tsuneo Sanda artwork over $995, shipping is FREE in the continental U.S. and there is NO SALES TAX when you purchase outside of Colorado. 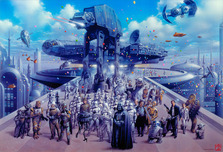 We SHIP WORLDWIDE and offer Layaway for Tsuneo Sanda art.